Inspector Jacques Clouseau returns in "The Pink Panther 2," to solve a international case that involves a globe-trotting thief that has mysterious talents in stealing historical artifacts. Inspector Clouseau must join with a group of International detectives called the "dream team" in order to solve the case and stop the Tornado from his recent wave of thievery. "The Pink Panther 2" was a unnecessary sequel, although it ended up being more enjoyable than the first Steve Martin remake. When it comes to the Pink Panther, nothing Martin does comes close to Peter Sellers legendary character, but he still ressurects a few laughs here and there to make for a painless movie going experience. 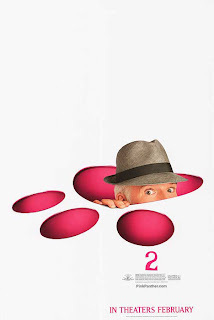 Directed by Harald Zwart and written by Scott Neustadter and Michael H. Weber, "The Pink Panther 2" as in any Pink Panther film should, has it's best moments as Clouseau fumbles through his detective duties. Where the Steve Martin sequel differs is the so-called "dream team" of international detectives, who are just as foolish as Clouseau is made out to be. Between the group of half-witted detectives there are quite a few laughs coming from some talented actors. "The Pink Panther 2" outside of Steve Martin has an all-star cast including Alfred Molina, Andy Garcia, Jeremy Irons, Emily Mortimer and Lily Tomlin. Returning from the first film are Jon Cleese and Jean Reno. Martin has a great scene with Tomlin, which is the first time the two have shared the screen together since thier 1984 film, All of Me. Martin's moments with all of the talented cast becomes one the few joys to the sequel that make for a far better caper than the first over-the-top remake by Steve Martin. For the better, Martin's version of Inspector Clouseau, feels a bit more restrained than what was delivered in his first attempt at the classic Pink Panther tale. The redundant comedic performance is less zany here in the sequel and works to the betterment of the film. Clouseau is obvisouly still put through some ridiculous situations in "The Pink Panther 2," but with the combination of a more reserved portrayal by Martin and some revised script writing, the 92 minute film becomes less tedious to sit through than it's predecessor. There is nothing new in "The Pink Panther 2" and you are probably better fit to just rewatch a Sellers version, but the film still does provide some good laughter and a diverting experience. For the younger generation, who would tend to have a hard time settling in to the original films, Martin delivers a decent Clouseau that stirs hysterical laughter and is family friendly. "The Pink Panther 2" is in no way a great film, but does decent the job at creating a few laughs and keeping a celebrated character alive for a new generation to enjoy.